The Flaming Lips and Stardeath and White Dwarfs just released their cover version of Pink Floyd‘s Dark Side of the Moon on limited edition seafoam green vinyl on Record Store Day. The CD just came out and we are sending it your way. 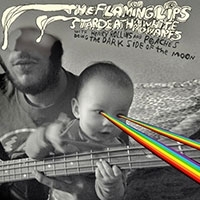 The album is the 13th full-length studio album from The Flaming Lips and the full title is The Flaming Lips And Stardeath And White Dwarfs With Henry Rollins And Peaches Doing Dark Side Of The Moon, so obviously it features Stardeath and White Dwarfs, Henry Rollins and Peaches. It is a track-for-track remake of Pink Floyd’s 1973 album. FCC warning on tracks 1 and 5. This release is going for adds on May 17th & 18th.